Online retailer Happy Beds has unveiled its new website, featuring an interactive Build Your Own Bed tool. The West Yorkshire-based company is hoping the new site - worked on by Elevate Web with SEO and user engagement support from Liberty Marketing - will help it become one of the UK's leading bed brands. Other features include mattress tension adjusters on the site's product pages, which allow users to see exactly how the tension of individual mattresses are affected depending on the consumers’ weight. 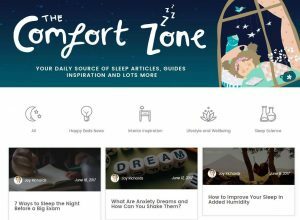 Happy Beds has also launched The Comfort Zone, a content marketing and customer service hub where lifestyle experts and Happy Beds’ team - notably its "Sleep Specialist" Joy Richards - provide insight and advice. Happy Beds’ CEO, known simply as Rex, is confident the new site will take the brand to “the next level”. He said: "We wanted to create an ‘in-store’ experience online. Buying a bed is such a personal, important purchase that it’s important to give customers as much information as possible." Founded in 2010, Happy Beds began as a third-party seller on Amazon and eBay before launching its own domain in 2012. Since then it has grown into a business with more than 20 full-time staff and a turnover of more than £3m. Based entirely in the UK, all of Happy Beds‘ products are built to order and sent from its Manchester distribution centre.